RIDDLE ME THIS! 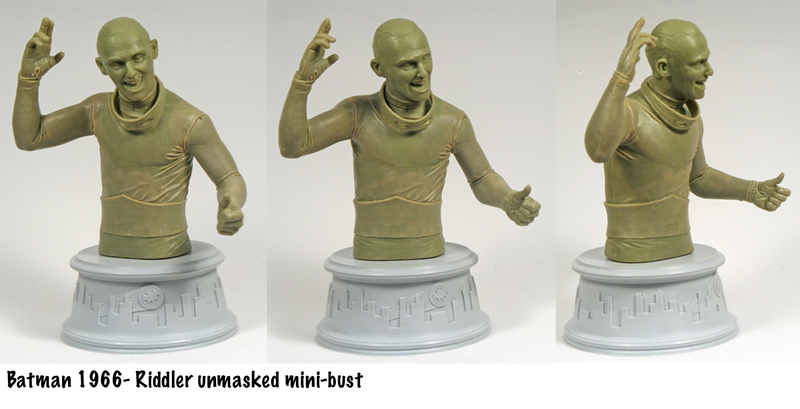 Why is it tough to do a Frank Gorshin facial sculpt for a Batman ’66 collectible? I have no answer, citizens. I just know that for whatever reason, everyone’s favorite Prince of Puzzlers is a tough nut in more ways than one. Mattel’s 6-inch figure? Solid. 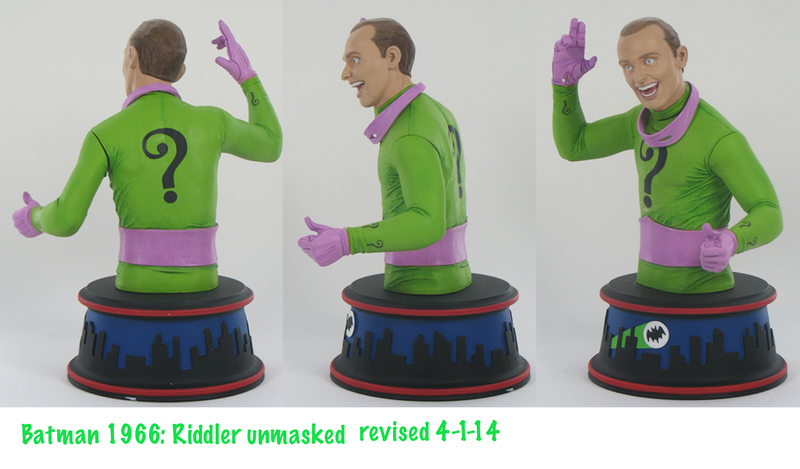 Figures Toy Company’s original Riddler? Solid. Figures Toy Company’s second Riddler? Uhhhh. Tweeterhead’s forthcoming Riddler? Those eyes are waaaaay too crazy. 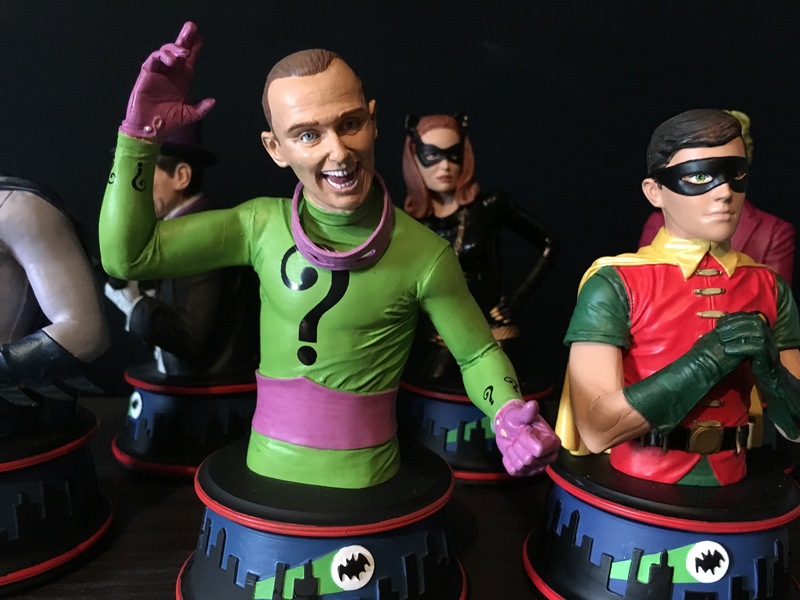 You ask me, designer Barry Bradfield and sculptor Jean St. Jean came pretty darn close with their King of Conundrums — the subject of Part 7 of BUILDING BATMAN ’66: The RIDDLER! Dan Greenfield: I love that you did this one without the mask. How did that come about? Barry Bradfield: This is the first version I drew, since I feel that Gorshin’s performance was a bit hidden when he had the mask on. It’s much better when you can see his full face. Both versions were drawn up just in case, but the final decision wasn’t mine to make. This is the version I was rooting for though, so I’m very glad it’s the final result! I felt that if the unmasked head were to be chosen, then the mask should be included somehow, hence its inclusion around his neck. Jean St. Jean: The Riddler spent a fair amount of time on the show without his mask, so it made sense to make Frank Gorshin unmasked. And I love the mask hanging around his neck. Dan: How badly do you want to do the Riddler in his derby and jacket? Barry: Oh, very! I always love that look for Riddler, and it’s too bad they didn’t use it more on the show. I thought it was interesting that he had two outfits at all, since villains mainly appeared in one only (disguises aside). 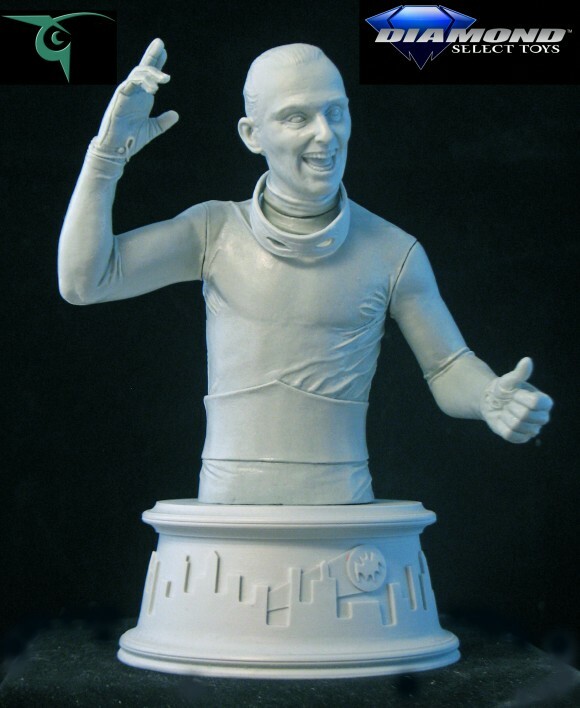 I would love to see it get made into a bust eventually, because there can never be enough of Gorshin’s Riddler. Dan: Which is your favorite Riddler episode? Jean: Ring Around the Riddler, where Batman boxes the Riddler in a prize fight! Barry: I really love them all because he’s my favorite villain on the show. It’s too bad Gorshin wasn’t present for Season 2. I don’t know if the episode in general is my favorite, but I absolutely love the boxing match between Batman and Riddler in Ring Around the Riddler. Like the surf competition with Joker, it’s just so absurd, yet fantastic to watch. I think my favorite Riddler moment is the end of Give ‘Em The Axe. Batman’s got Riddler writhing in agony just by holding one of his hands. It’s so well played by both actors.